On the third anniversary of the Scottish Climate Change Act today Stop Climate Chaos Scotland (SCCS) is warning Scotland’s progress towards meeting our world leading climate targets is at a crucial crossroads. Despite the Climate Change Act receiving unanimous backing by MSPs in 2009, there are substantial fears the targets over the next decade will be missed due to a lack of substantive action to cut emission levels. Indeed if the Scottish Government sticks to its current course, it risks only meeting one target between now and 2022. SCCS is warning the Scottish Government must act quickly to ensure the targets are met and say the revised blue print for achieving them, the Report on Proposals and Policies, must be more ambitious when it is published later this year. “Three years on from the Scottish Climate Change Act being approved by MSPs the Scottish Government’s climate policy is at a crossroads. “They can choose to stick to their current path and miss the targets, risking our global leadership on this agenda and forfeiting the many benefits Scotland could enjoy, or they can take action now to put us on the right road to a low carbon future. “Our world leading legislation is still lacking the world leading policies we need. “The next climate action plan from the Scottish Government must include new measures to reduce emissions from cars and homes. Tackling our poor housing and providing attractive alternatives to the private car would cut climate emission whilst saving families money and improving Scotland’s health. “With emissions from transport still above 1990 levels, the Scottish Government has so far made absolutely no progress. “Transport is the second largest sector for emissions – and on course to become the largest before too much longer – so the Government needs to get its head out of sand. Without action on transport, the Government cannot meet its climate targets. 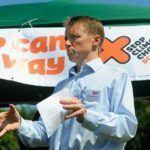 “What is worrying is that the current administration’s multi-billion pound road-building programme is certain to generate even more emissions. “Only a bold approach to retrofitting homes throughout Scotland can tackle the twin scourges of fuel poverty and climate change emissions at the pace and scale required. “At the same time, improving the energy performance of Scotland’s existing homes presents massive opportunities: helping to eradicate fuel poverty and its associated mortality and health problems; stimulating green jobs and boosting the hard-pressed building industry, as well as reducing green house gas emissions.